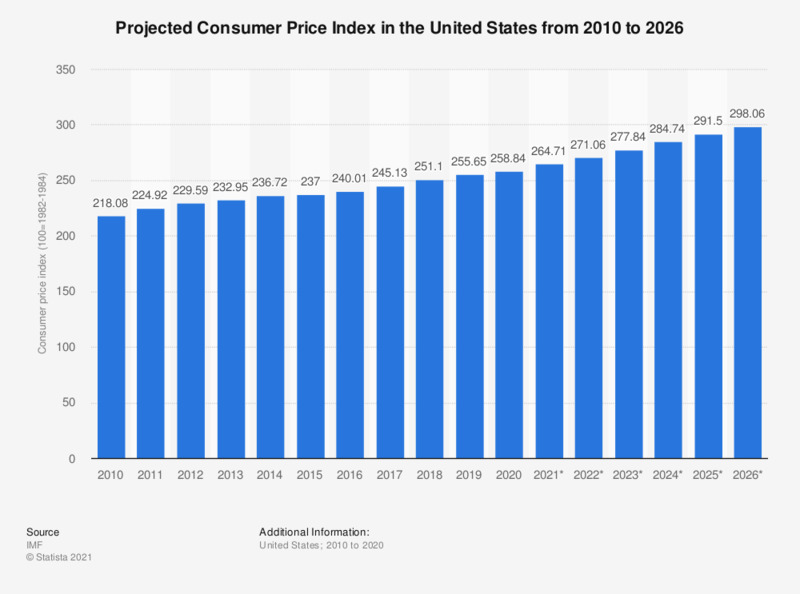 This statistic shows the consumer price index in the U.S. from 2010 to 2017 with additional projections up to 2023. The base period was 1982-84. In 2018, the annual Consumer Price Index is projected to be at about 251.38. The U.S. inflation rate for 2017 was projected to be 2.65 percent. According to data published by the International Monetary Fund, the US Consumer Price Index (CPI) was 224.94 in 2011, compared to the base period of 1982 to 1984. It is projected that the CPI will continue to rise year over year, reaching 274 in 2022. The Consumer Price Index of all urban consumers in previous years was lower, and has risen every year since 1992, except in 2009, when the CPI went from 215.30 in 2008 to 214.54 in 2009. The monthly unadjusted Consumer Price Index was 233.5 for the month of June in 2013. The US CPI measures change in the price of consumer goods and services purchased by households and a key value in calculating US inflation and the health of the economy. The US Department of Labor’s Bureau of Labor Statistics calculates the CPI and defines it as, "a measure of the average change over time in the prices paid by urban consumers for a market basket of consumer goods and services." The BLS records the price of thousands of goods and services month by month. They consider goods and services within eight main categories: food and beverage, housing, apparel, transportation, medical care, recreation, education, and other goods and services. They aggregate the data collected in order to compare how much it would cost a consumer to buy the same market basket of goods and services one month or year against how much it cost in a previous month or year. Given that the CPI is used to calculate US inflation, the CPI influences the annual adjustments of many financial institutions in the United States, both private and public. Wages, social security payments, and pensions are all affected by the CPI. Data represent U.S. city averages. The base period was 1982-84=100. The consumer price index (CPI) measures changes in the price level of consumer goods and services purchased by households. The CPI is defined by the United States Bureau of Labor Statistics as "a measure of the average change over time in the prices paid by urban consumers for a market basket of consumer goods and services."